The lake shore (or littoral zone) is the shallow area along the shoreline of a lake or pond which supports diverse communities of rooted plants and serves as food, habitat and protective shelter for fish, insects, amphibians and other aquatic animals. These diverse plant communities also provide cover and nesting materials for a variety of wild birds and mammals. 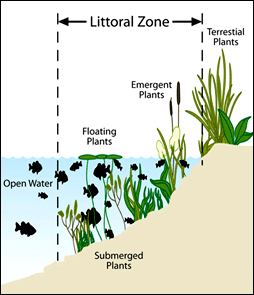 Management of littoral zones is often necessary in systems altered by humans. Aquatic plants, especially rushes and cattails, dampen the force of waves and help prevent shoreline erosion. 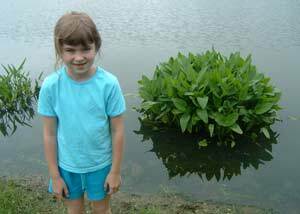 Submerged aquatic plants also weaken wave action and help stabilize bottom sediment. As a natural component of lakes, aquatic plants support the economic value of all lake activities. Kentucky has a huge tourism industry centered on lakes and the recreation they support. Pond edge plantings compete directly with the algae for nutrients. If selected properly, these plantings will add significant visual value to the body of water and surrounding area with their foliage and blooms. Many species are very low maintenance and come back year after year. Some may require occasional trimming and/or replacement. Most importantly, their root stock cleanse the water from the storm water runoff which is likely to contain harmful chemicals such as asbestos, copper, chromium, lead, nickel, phosphorous, zinc, oil, grease, herbicides and pesticides. 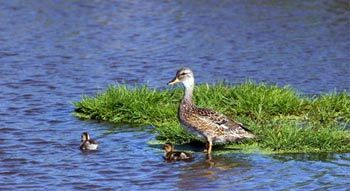 The establishment of wetland vegetation improves water quality by recreating the natural wetland filtering mechanisms. Amoung the most important of these mechanisms is the ability to remove nitrogen and phosphorous. Another benefit of native vegetation is preventing bank erosion and capturing sediment. The thick root systems of native plants hold the soil on the banks and slopes above bodies of water, keeping sediment from clouding the detention basin. A Floating Island is essentially a balancing act that uses specially selected plants and a custom, proprietary mix of microbes to keep nutrients from building up. Because the plant roots on a floating island are in direct contact with the water, they are constantly extracting nutrients - so not only are they helping clean the water, they are also thriving in the process. 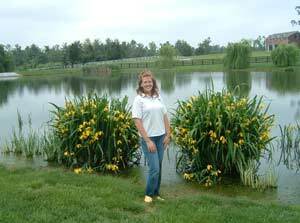 Floating Islands are an effective tool in maintaining the health of ponds and lakes. The islands use a synergistic combination of plants and high surface area substrate (matrix). In conjunction with our proprietary microbes and aeration, our islands can additionally help keep water clear and clean. These microbes work synergistically with the matrix and roots of plants to remove excess nutrients from the water, greatly reducing algae growth, without harsh chemicals. Fish benefit from improved water quality, and roots growing down into the water provide a food source for small fish - which in turn feed the big ones. Fish congregate under the islands to take advantage of the shade and to escape avian predators like osprey, eagles, and herons. Lush with green growth and the colorful splash of flowers, the Floating Island is an enchanting addition to the waterscape. Islands can be fit with wind-generated aeration, solar lighting, and other useful features. Floating islands provide nesting and resting habitat for redhead ducks and loons, avocets and snipe, and a myriad of other bird species. Frogs deposit their eggs on the plant roots, salamanders cruise the waterline, turtles haul out to bask, and glinting blue dragonflies dart and hover.